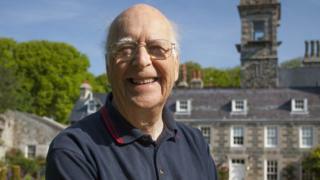 "A reformer" and a "quiet man" is how the Seigneur of Sark has been described after his death on Sunday. Michael Beaumont, a successful aircraft engineer, inherited the title from his grandmother, the Dame de Sark, Sibyl Hathaway, in 1974. Lt Col Reg Guille, President of Chief Pleas, said the news came as a shock and he would be missed. His son, Maj Christopher Beaumont, has inherited the title from his father and will become the 23rd Seigneur. Lt Col Guille said: "He was a quiet man, a very private gentleman but ran the island quietly and firmly but he wasn't a showman. "He saw the title as his duty that he willingly gave his life over to." The minister responsible for Crown dependencies, Lord Faulks said: "I was deeply saddened to hear today of the passing of Michael Beaumont, Seigneur of Sark. Our thoughts are with his wife Diana and his children." The Lieutenant Governor of Guernsey Vice Adm Sir Ian Corder, said that he and Lady Corder were "extremely sorry to hear the sad news" and expressed their deepest sympathies for the family. Mr Beaumont was 11 days short of marking 42 years in his position. Lt Col Guille said he "had a significant impact on our island in this period of time". The popular and traditionalist Seigneur clashed with the Barclay brothers, who bought the island of Brecqhou in 1993. The pressure brought about by these events resulted in fundamental changes to Sark's feudal laws by 2009. Lt Col Guille said Mr Beaumont fully agreed with the change to a full democracy: "He was uncomfortable with the hereditary nature of Chief Pleas and felt a fully democratic parliament was the way forward." Many of the Seigneur's ancient rights and duties were revoked, including having the sole right to keep pigeons on the island.